Spring has finally arrived – according to the calendar of course, not necessarily according to the weather! 😉 But it still has me thinking about the upcoming warmer days ahead. 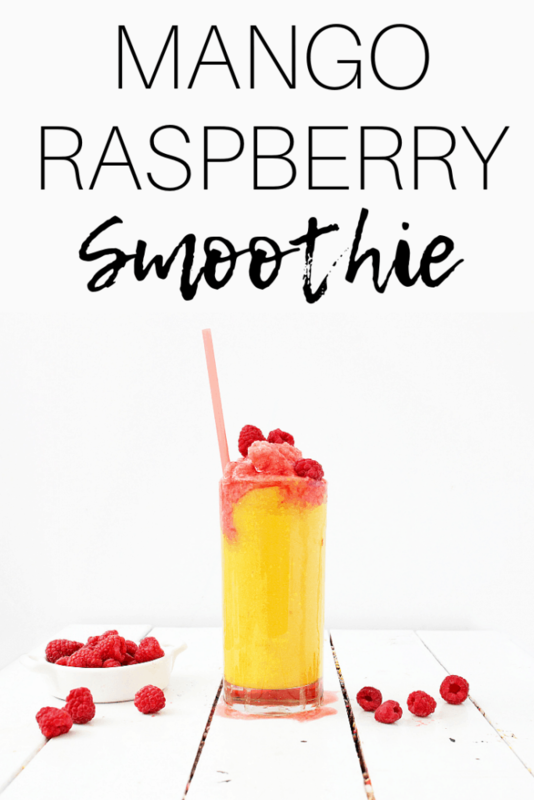 Nothing tastes better on a warm day than an icy smoothie – and this mango raspberry smoothie is one of my favorites! This smoothie is really easy, and if you want, you don’t even have to worry about layering it. You could totally just toss all the ingredients into the blender together and voila – all done. 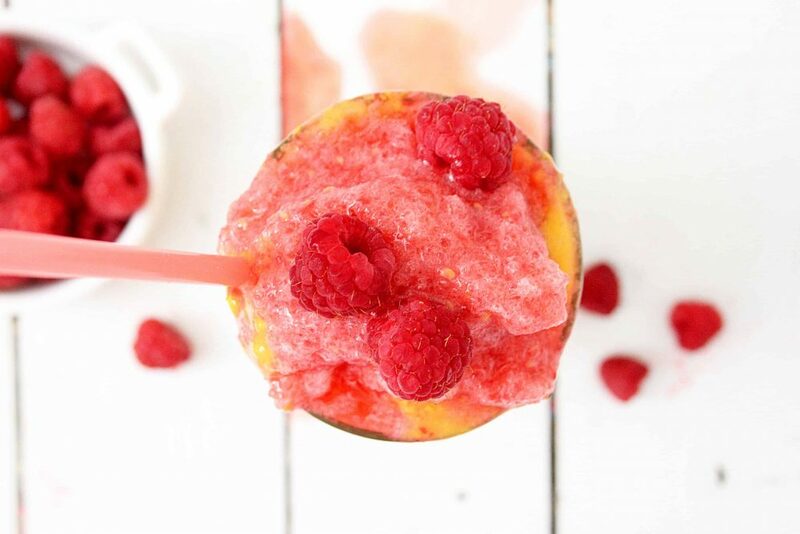 Garnish it up with a few fresh raspberries and you’ve got your insta-worthy smoothie! Orrrrr, just gulp it down outta your portable blender cup if you’re starving and need nourishment NOW (#sorrynotsorry). If it’s your first time buying a mango to make this smoothie, you might find it a little intimidating – but no worries, my friend. The inside of a mango has a relatively flat, stone-like pit in the center. To avoid this, you want to cut off each side of the mango while leaving that stone like pit in the center. Hold the mango upright on the cutting board and imagine that pit running down the center. Then cut the sides off of the area where you’re visualizing the pit, leaving around an inch in the center where that pit is. Some people have asked me how you know which direction to cut each half off. You can tell if you’re doing it correctly if you don’t hit resistance while cutting it. And once it’s cut, you’ll see or feel that pit in that one inch center section. Now, take those halves and lay them on the cutting board. Cut them in a checkerboard pattern, then pop out the flesh part. Then you can use a knife to cut the mango out, along the peel. If you’re having trouble visualizing this, here’s a great mango tutorial with photos. Other beneficial phytochemicals, which are plant-based components of food that help your body. Both mangos and raspberries are rich in these! This recipe makes two snack-sized servings, so you can split it with your kiddo or with a friend. It’s a great option to share with your child as it’s nutrient-dense but still satisfies the sweet tooth. (Note – if you plan to share with a little one under age 1, skip the honey as it’s not recommended for infants). You can also drink the whole thing as a meal-sized portion. If you do that, I’d recommend maybe adding in a little dairy free protein powder (like a pea protein, hemp protein, or a plant-protein complex). This will help make it more balanced for a meal. The only top 8 allergen that this contains is tree nuts from the almond milk. 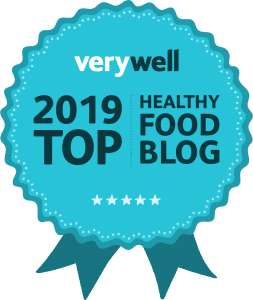 If you have an allergy to nuts, you can easily switch that out for another milk alternative like oat milk, rice milk, or Ripple (pea protein milk). 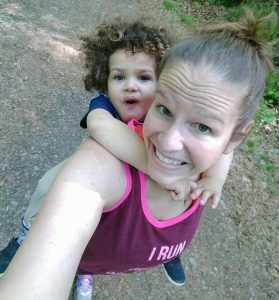 Need a healthy dairy free smoothie recipe? 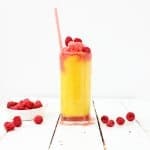 Try this mango raspberry smoothie! It’s made with just a few simple ingredients and makes a great healthy snack. Place the chopped mango, frozen banana, almond milk in the blender and blend until smooth. Pour into your glasses, dividing about equally. Give your blender a quick rinse. Set aside a few raspberries that you’ll use to garnish your smoothie. Place the rest of the raspberries in the blender with 1/2 cup of ice and 1 tbsp of honey (optional). Blend until smooth. 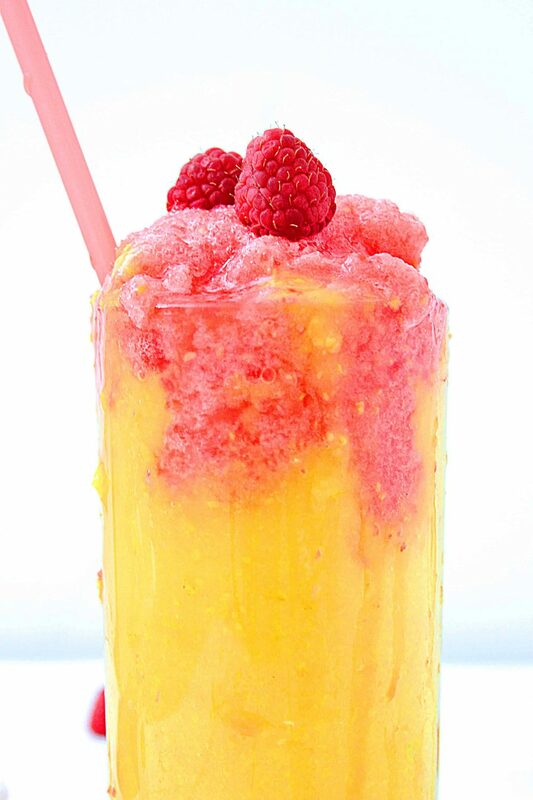 Spoon the raspberry mixture on top of the mango layer, and garnish with whole raspberries. Grab a straw and enjoy this beautiful smoothie! 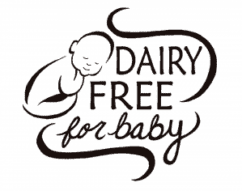 Share: What’s your favorite kind of dairy free smoothie? 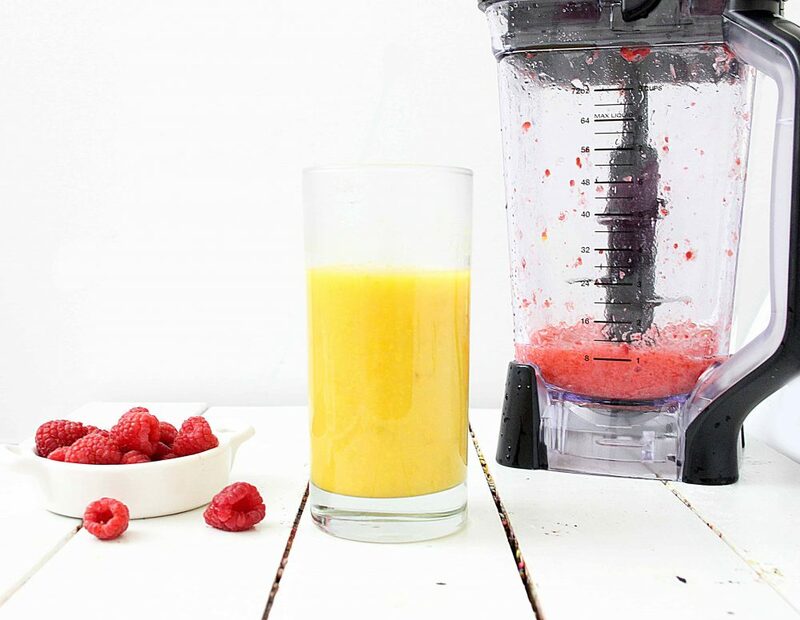 If you tried this mango raspberry smoothie, what did you think?